The following two recipes are from the Democratic candidates running for U.S. House of Representatives in Florida’s 18th Congressional district. Both recipes serve deliciousness in extremis, but both involve planning, careful preparation, and, in the case of the gumbo, expense. Both recipes demand patience, attention to detail, and generosity, fine qualities to look for in a candidate for the U. S. House of Representatives. Pam Keith’s grandmother grew up in New Orleans. Her recipe for “Righteous Gumbo” is exactly the mahogany roux-ed stew brimming with seafood for which New Orleans is famous. Equal parts earthy and briny, this is pure NOLA, and it is spectacular. Make it for people you care about. Lots of them. One taste, and they will understand the depths of your affection for them. 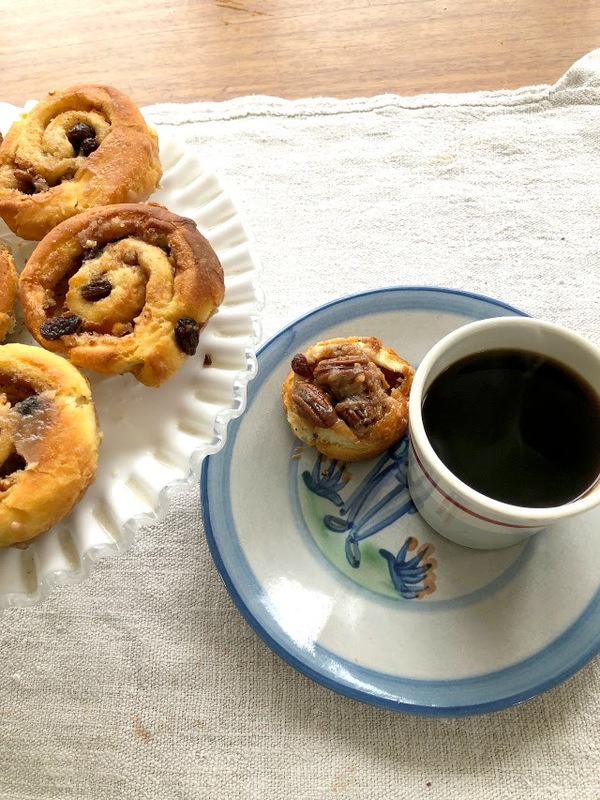 Lauren Baer’s Schnecken recipe has been passed down from her great-grandmother, Serena Fireman, for whom Baer’s daughter is named. Baer learned to make these “amazing” rich rolls of dough, secreting layers of brown sugar, raisins and pecans, from her mother, Nancy, who learned at Serena’s side. This is a recipe that requires planning and time; the special richness of these rolls with that caramel-pecan-y bottom can transform a Sunday morning into a holiday. My fondest childhood memories of my Nana (Robertine Freeman Wilson) was making Gumbo with her in Oakland, California. She didn’t make it often, but when she did, the whole family went on full alert! EVERYBODY would come over to Nana’s to get a Tupperware of it to take home. For me, Gumbo means seeing all of my extended family and eating a concoction that literally made EVERYONE swoon. My Nana would shop all morning that she was making a Gumbo. She would take me all around to make sure we got the best ingredients, and she would wrangle with the fish-monger to get the freshest crab possible. Nana also put okra in her Gumbo, which absolutely RUINED it for me. Okra is the vegetable of the DEVIL! It slimes everything it touches. So, after much whining on my part, Nana would make the Gumbo without, put aside a pot for me and my brother, and then add the okra to the big pot for everyone else. To this day, I see no justification for Okra. EVER! The keys to a good Gumbo are preparation, focus, timing and LOVE! 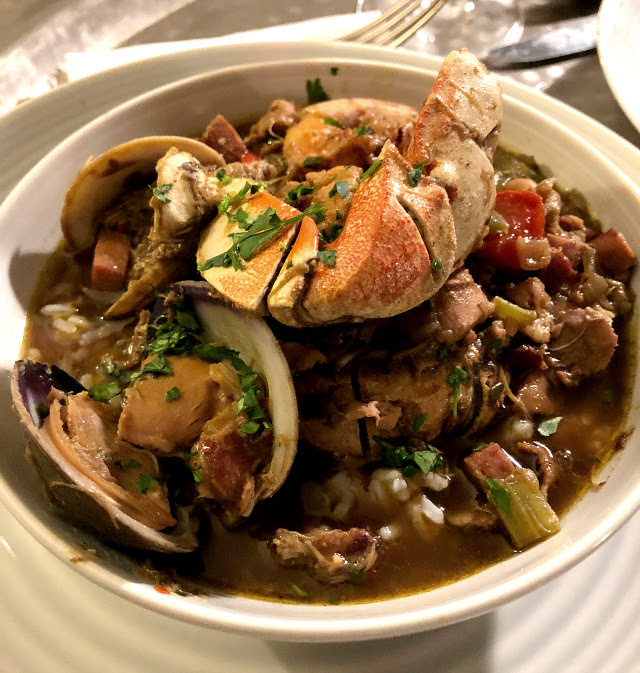 Gumbo should be made for those whom you really love and enjoy. READ the whole recipe and make a THOROUGH grocery shopping list! You can’t stop the cooking process to go back to the store to get something. Use the biggest pot you can and make sure you can cook without distraction. Chop, clean and prepare all your ingredients FIRST, so they are ready to go when you need them. “Doctoring” a Gumbo to taste is the last, but KEY step. I serve Gumbo with either beer or Red Zinfandel wine and brown rice. Gumbo is expensive! Splurge for quality ingredients. DO NOT waste good ingredients on a BAD roux. If the roux overcooks, start OVER! The pot will make many servings and it freezes well. Make sure your veggies are chopped and ready to go BEFORE you start the roux. The water in the veggies will cool down the roux and prevent it from overcooking. Stir the roux CONSTANTLY over medium heat about 15 min. It will start to deepen in color from white to beige and then darker as the flour caramelizes. DO NOT OVERCOOK THE ROUX! The perfect color is LIGHT caramel, but err on undercooked rather than over cooked. If it starts to look like chocolate, THROW IT OUT! Stir to mix well and cook for 5 minutes on medium heat. You are now ready to build your Gumbo. Reduce the heat on the Gumbo to medium low. Add more chicken stock if needed. You are NOW ready to “doctor!” My Nana would spend more than hour “doctoring her Gumbo,” adding a little of this and that to get the flavor just right. I do less, but doctoring is key to balancing flavors. Here is a list of things I add “to taste” to get a full, robust and balanced flavor. When you’re satisfied with the flavor, turn OFF the heat on your Gumbo and let it sit. It will be too hot to eat for about an hour. Remember that people will use their fingers to eat the clams and crab pieces. Make your rice and chill for a while. You’ve worked hard to build a “Righteous Gumbo!” CHEERS! Dissolve yeast in luke warm water. Stir in sour cream, salt, yeast and eggs. Beat in one cup flour at a time, beating well after each addition, and ending with the ½ cup. Cover dough in the bowl tightly with aluminum foil and a towel. Place in refrigerator overnight. In a medium bowl mix together ingredients for Raisin Filling. Remove dough from refrigerator, and let stand in a warm place for 2 hours. Divide dough in half. Place one half on a lightly floured board, and roll into a rectangle about 24” x 8”. Spread with half of the melted butter and half of the raisin filling. Roll from long end as for a jelly roll. With a bench scraper or a very sharp knife, cut into 12 pieces 1 ½” wide. Butter 24 regular sized muffin tins, and place 3 pecan halves into each tin. Pour a few tablespoons of brown sugar syrup over nuts, and place a slice of rolled dough cut side down on top of nuts and syrup. Cover, and set in a warm place to rise until double in size. Repeat process with 2nd half of dough, remaining melted butter and raisin filling. Preheat oven to 375 degrees F. Place a cookie tray underneath the muffin tins in your oven, as the syrup will bubble up and spill over. Bake Schneckel for 12-18 minutes, or until evenly browned. Remove from oven to cooling trays. Let sit for no more than 5 minutes, and then remove from pan, spooning back over them any remaining syrup or stray pecan. Place butter, brown sugar, and water in a medium saucepan. Let come to a boil Cook 3 minutes until blended.